Twenty four leaders of the Hindu Community in Colombo formed themselves into a society under the name ‘Hindu Educational Society’ with a view to take meaningful steps to facilitate the Hindu students in the city having their education in their own religious and cultural background. That significant assembly of those great men of vision and foresight was held in Colombo on February 5, 1951 under the chairmanship of Hon. Justice Chellappah Nagalingam K.C. who later became the head of the Judiciary of this country as an acting appointment as the Chief Justice. ‘What bigger gift can one generation pass to another than a school’ - a temple of learning? It was a gift that did not come easily. It was a gift that arose out of a challenge - a challenge that faced the Tamils in Colombo and the Hindu community in particular, when numerous children and parents knocked at the gates of many a school in Colombo and were turned away. They had to face a question ‘We have no room for children of other denominations. Why don’t you people have your own school?’ This attitude was expressed quite openly. One could not possibly blame them. It was anyway a big challenge. As one who has been associated with the activities of the Hindu Educational Society from its inception I am glad to record that the Tamil Hindu Community in Colombo accepted the challenge with fortitude. On February 12, 1951 the Hindu Educational Society (‘HES’) gave birth to this school under the name ‘PILLAYAR PADASALAI’ at Sri Kathiresan Kovil ‘Madam’ only with 48 children. 4. Dr. A. Kandiah, A.R.C.S., D.I.C., Ph.D., D.Sc. (Lond. ), A.I.C. 10. K.T. Chittampalam, Proctor S.C. and N.P. 22. A. Ragunather, B.Sc., (Eng.) A.M.I.E.F. C. Nagalingam was elected the first President of the HES. Sir Kanthiah Vaithianathan and Senator Peri Sunderam were elected Vice-Presidents. S. Mahadevan was the first Secretary and K. Satchithananda the first Treasurer. Messrs S. Somasunderam, M.M. Kulasegaram and A. Ragunather were the other members of the first Board of Governors. R.M. Palaniappa Chettiar, A.N.R.M. Ramasamy Chettiyar, KR. KN.AR.KN. Ramanathar and S.K. Vaiyapuri were the first representatives of the Trustees of Sri Kathiresan Temple to attend the first meeting of the HES. Messrs. M.S. Kandiah and A. Ragunathar were responsible for making the preliminary arrangements. Those 24 founders’ initial task was to find money to launch the school project and their target was to collect Rupees Ten Lakhs. A pamphlet was issued - 10,000 copies in English and 5,000 copies in Tamil - and they said in their appeal issued on February 20, 1951 as follows:- “We have thought it proper to call upon ourselves - 24 founder members of the Hindu Educational Society - to make the initial sacrifice in this great cause. “And so it was that the beginning of the year 1951 saw the formation of the Hindu Educational Society for the sole purpose of establishing a Hindu School, not in a spirit of competition or rivalry with any other institution but to supplement the task of these institutions and to take the overflow from them with which they were unable to cope. It is on this leased land the Lorenz Road front portion of the school and Saraswathie Hall now stand. The portion of the land on which the Saraswathie Hall stands was separated by HES before the school was taken over by the Government in 1962, but the College has been given free use of the Hall whenever it required. In the month of March 1951 the Pillaiyar Padasalai was shifted to the present premises. K. Pathmanathan was the first Principal of the school. T. Sathasivam functioned as the Head Master of the Primary School. “Planning for the future certainly calls for introspection; deep thinking, sound and sober judgement and far-sightedness. “One cannot of course chart a new course for an institution that has a solid achievement of 25 years behind it and the interest of future generations ahead, without relating to the life of the Community that it serves and the life of the nation as a whole. “In the case of an individual it may be possible to pull out roots and look for better soil elsewhere. “But in the case of institutions such as this, representing as it does the trust placed on us by the founders, many of whom are no more with us, our responsibility is greater, men such as Justice C. Nagalingam, S. Mahadevan, Sir Kanthiah Vaithiananthan, Dr. A. Kandiah, M. M. Kulasegaram, K. T. Chittampalam, Senator Peri Sundaram, A. Subramaniam, A.Ragunather, V. A. Kandiah. The parents and well wishers of the school envisaging a well planned institution and desirous of ensuring an integrated development of the physique and mind of its students decided to acquire land at Ratmalana for expansion. The land was acquired and foundation stone for the new building was laid by Sir John Kotelawala, (Prime Minister) on May 2,1953. Owing to the interest taken and support given by our community led by the HES the majestic buildings which stand there now took shape. Before the completion of the buildings, the post primary students from Bambalapitiya were shifted to Ratmalana in 1955. During the course of time Bambalapitiya school began to function as primary school and the school with upper classes at Ratmalana as Colombo Hindu College as a post primary school. One principal served as the head of both the institutions. 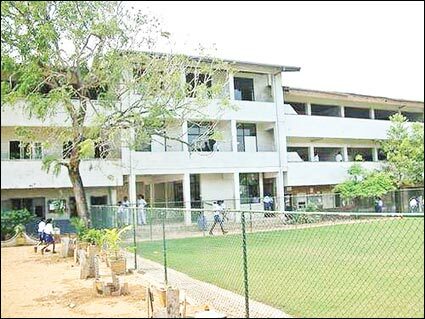 The history of the growth of Hindu College Colombo at Bambalapitiya) will be incomplete if we fail to honour the services done by the heads of our school at the initial stages. It was K. Pathmanathan, the first Principal, who took a keen interest in the development of the school and paved the way for its smooth growth till 1957. (T. Sathasivam was the headmaster of the Primary section). His service was continued by N. Satyendra (Barrister) who functioned as Principal in an honorary capacity in 1958. Following him T. Subramaniam (1959-62) and S. Ambalavanar (1963-67) served as Principals.